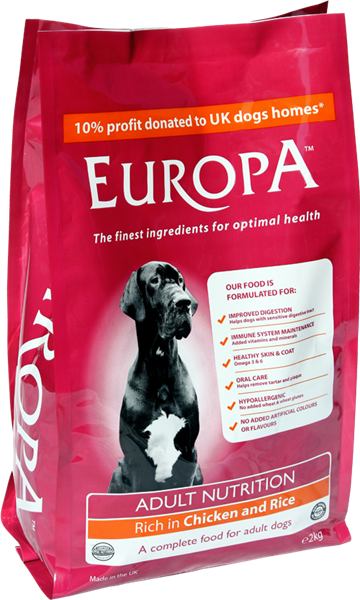 All Europa dog food is hypoallergenic and each product is formulated without wheat or wheat gluten. Chicken Meat – helps those dogs with a sensitive digestive tract or who find it difficult to process other meat based foods. Beet Pulp – a superb source of soluble and insoluble dietary fibre which is important for maintaining normal intestinal transit time and stool motion. Immune System Maintenance & – Europa Super Premium Adult and Rice contains specific vitamins and minerals to help maintain your dog’s immune system. Healthy Skin and Coat – contains both Omega 3 and Omega 6 essential fatty acids, along with Zinc and Biotin to help maintain a healthy, shiny coat and skin. Oral Care – our special size of kibble or biscuit helps to remove tartar and plaque, keeping your dog’s teeth clean and healthy. Hypoallergenic – a hypoallergenic food is one that only contains ingredients that are better suited to a dog’s natural digestive system and are designed to address a food allergy. An allergic reaction to one or more ingredients can cause itchy skin, hot spots, hair loss, upset stomach, diarrhoea and vomiting. Yucca Schidigera – helps to reduce faecal odour. Age range: From 12 months to 6 - 8 years of age depending upon size and breed. It is very important that you introduce the food slowly to your dogs diet. We recommend this because a dog’s stomach can be sensitive to nutritional changes. Please remember that every dog requires fresh, clean drinking water to be available at all times. So good I eat it myself!